Back, from left, Oisin Beard, Monty Aplin (both Gala Harriers), Innes Cormack (Moorfoot Runners), Ross Christie (GH), Thomas Hilton (MR), Rory Antrobus (GH). Front, from left, Zico Field (Chirnside Chasers), Danny Lancaster, Cammie Carlyle, Fionn Hollingsbee, Kai Keen (all MR). The Irish Met Office may have named last week’s snow and winds as Storm Fionn. But there was another storm Fionn on this side of the Irish Sea on Saturday, in sunny Broxburn, to be more precise, at the third and final East District Cross-Country League meeting. Moorfoot Runner Fionn Hollingsbee stormed to a clear 11-second victory in the Under-11 Boys race over the snowy, undulating 1.4km course, leading his team home in 5 minutes 29 seconds. With clubmate Thomas Hilton fourth in 5.45 and Gala Harrier Ross Christie just inches behind in fifth, in the same time, the Borders boys were convincing in repelling the expected challenge from Aberdeen AAAC, who had been only five points in arrears going into the race. The lead was extended to 30 points to secure the league title and the ESH Cup for the fourth time in the seven years since the composite Borders team was formed for the East League. There were also runners-up spots for Team Borders in the Under-13 Boys league and the combined Under-17/Under 15 Girls league, but an incomplete team saw the U17 Men drop out of contention. It takes a lot to cause a cross-country race to be called off and the record number of runners at Broxburn shrugged off the three inches of snow on the tough course and enjoyed sunny, pleasant conditions, even if the temperature gauge barely rose above freezing. Ewan Christie (Gala) has been running well all winter and knocking at the door of podium places, which he duly achieved in the Under-13 Boys race over 2.7km with an excellent second place in 10.25, just being outsprinted down the home straight. Fellow Gala Harrier Cameron Rankine was 17th in 11.39 and Ben Allan (Moorfoot) returned from a three-week injury lay-off to claim 25th in 11.48. That placed the boys fourth on the day in a very close competitive team race and second overall in the final league placings. 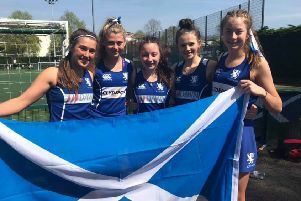 It was a similar story for the Under 17/Under 15 Girls - they finished fifth on the day in their 4.1km race and second in the league overall behind runaway winners Edinburgh. Team scorers were Mairi Wallace (Moorfoot) 15th in 18.19, Tilly Leathart (Moorfoot) 20th in 18.39 and Eilidh Forbes (Gala) 24th in 19.17. First race off was the Under-11 Girls’ race, where Team Borders took sixth place through the Moorfoot trio of Sophie Logan (16th in 6.38), Stella Davidson (23rd in 6.49) and Ava Mooney (29th in 6.54). The Under-13 Girls matched that position and were sixth in the final league placings. Anna Fairclough (Gala) led the team home with her 12th place in 12.37, with the Moorfoot duo of Madeline Collins (21 st in 13.00) and Esme Minto (24 th in 13.06) completing the team points. There was just one Team Borders runner in the Under-15 Boys’ race over 4.1km – Gala’s Gregor Collins had a strong run for seventh in 15.34. And it was a similar story in the Under 17 Men’s race over 5.4km, with Gala’s Lewis Tharme the sole Borders finisher (16th) in 21.34.